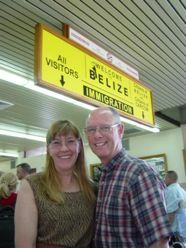 Immigrations, Passport Stamps... Customs and How To Get Going! 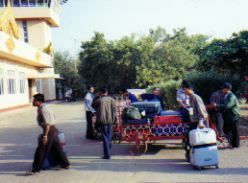 Airport Arrival! You've planned and dreamed and now your trip has started. You've landed in a foreign country... now what? ...but if you're new at this, here are some tips on what to expect at your airport arrival. We have tips on Airport Departure too. Honestly... some people say they don't like airports, but... we think the Airport is Your Friend. On arrival... you may have jet lag. ...and you have to get through immigrations and customs. 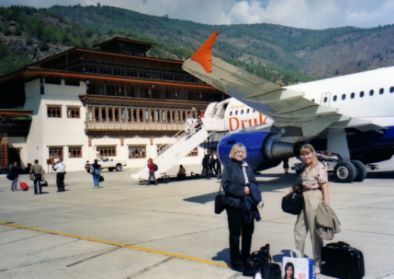 If you're at a less visited destination, you may climb down stairs and cross the tarmac to a cute little airport like this one in Paro, Bhutan. ...Then you have to walk down those (usually) long concourses to the Immigration Hall where you have to get through Immigration. All you need to do is to follow the crowds. Think twice about using a cell phone too. In some countries it can get you in trouble to take any pictures. In other countries, signs will tell you no cameras or cell phones are allowed in the Immigrations area. Concentrate on getting through immigrations and customs, if you think you must have a picture of your airport arrival, ask first. Maybe... In many counties you may encounter military security guards toting machine guns. Don't let this alarm you... it's standard operating procedure and has been for years... since long before all of today's security concerns changed the way you pack. There Are Guys Walking Around With Guns! Yep, maybe there are... In many counties you may encounter military security guards toting machine guns. Have your passport out and make sure all of your arrival paper work is filled out. Fill out Immigration Forms as soon as you get them. 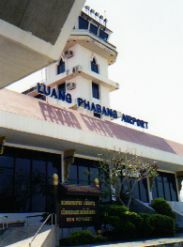 You may be handed immigration forms when you check in at the airport or your flight attendants will hand out the appropriate documents before you land. Whenever you get this paper work, don't just shove it in your carry-on... fill it out right then. If you need help, the flight attendants can answer questions and should be able to help you fill them out correctly. Know if you need a visa and if you do, when you need to get it. You should have your visa before you leave home if you need one, or be prepared with the proper currency and forms if the country you are entering gives visas on arrival. If the country you are visiting says you can get a visa on arrival, but it is recommended to get it ahead of time.... do get it ahead of time. It will save you time and probably some jostling to get your visa ahead of your airport arrival. Once you reach the Immigrations area, you'll find some airports will have orderly lines with ropes to keep the line or queue moving in a fair and controlled fashion. At these there will usually be lines for "Citizens and Residents" and another line for "Visitors" or "All Other" something like that. Other airports have a few desks with over worked immigrations agents, and the crowds of passengers rush forward in a semi-controlled, or totally uncontrolled free-for-all. Sometimes the lines are long, but that's just part of travel and airport arrivals... always has been. In some countries the chaos theory seems to rule... there may be some shoving and jostling. Just make sure you stay alert and guard your valuables and look at it as part of the experience. I remember going through immigrations in Mali... being nearly the first off the plane, but the last through Immigrations because we just didn't want to shove and push our way to the front. We were a little later getting to the hotel for the night, but who cares? Whatever you encounter at your airport arrival, just take a deep breath, make sure you are in control of all your carry-ons and make your way to the front without getting too frustrated.... that's just how things are in some countries.... and you're traveling to experience a different culture aren't you? When Do You Get Your Luggage? You'll go through Immigration before you can get to baggage claim to pick up luggage you might have checked. --and tons of taxi drivers and others wanting to "help you". Our advice is to smile, keep saying no thank you and walk to a quiet corner of the airport for the next step or meet up with your group or tour guide. Don't be in a rush to leave. Get help, money, information. We tell you about that... remember, we think The Airport Is Your Friend! And don't forget Airport Departure. Travel Security Alert Packing Guide What Can You Fit In That Plastic Bag?